It’s finally November, and that means it’s also germ season. Having two little kids means that I’m always cleaning, cleaning and cleaning some more. I even make sure to take extra disinfecting wipes to my son’s classroom so his neat and tidy teacher doesn’t run out either. But no matter how much I clean, one of the kids will come home with the sniffles. It just happens, so I make sure I’m prepared. 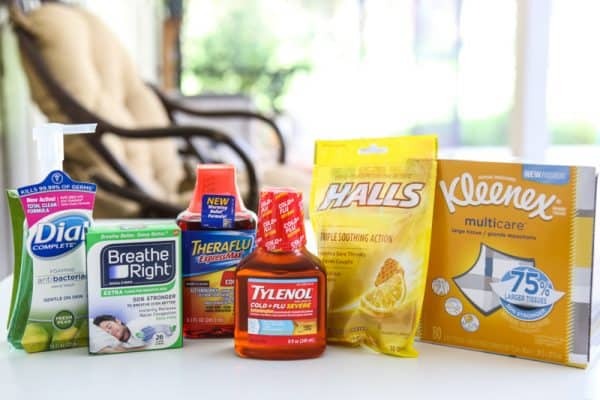 This past week I stopped by my local Kroger and made sure to stock up on all the things that will keep my family prepared for any seasonal sniffles that might arise. 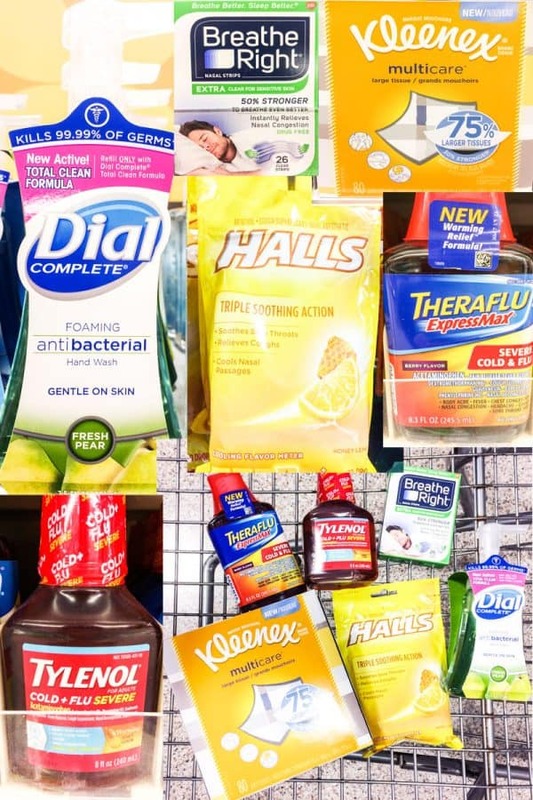 I never like to have to run out and get those supplies after I find out a kid is under the weather, it’s just too stressful! So I stocked up on all the essentials for any sniffle that one of my kids might bring home. I know most people keep their medicine cabinets in their bathrooms, but my kids are just too sneaky. I don’t trust them in a room that they might be alone in. 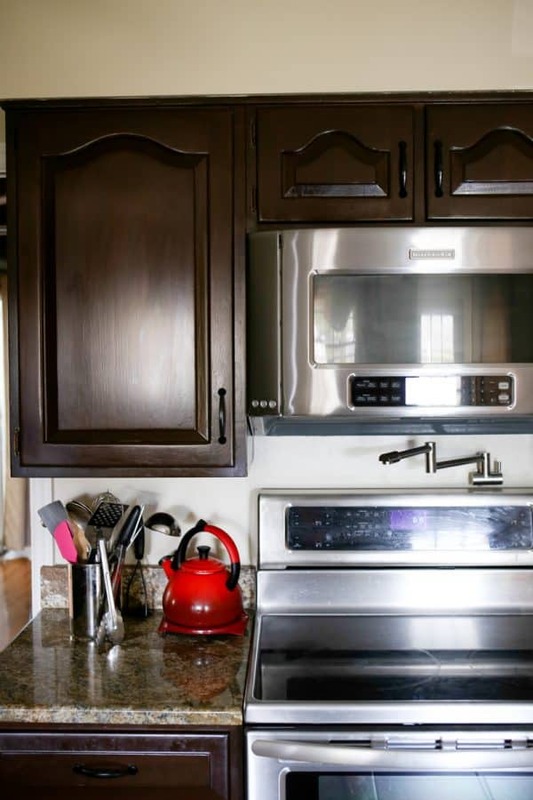 So we decided years ago that our medicine cabinet would be in the kitchen. It’s out of reach of little hands, and if you have a climbing tot like I do, at least it’s in a place where I can keep an eye on them. Behind this door, I’ve turned an old spice cabinet, into a medicine cabinet! But it was time to clean out this medicine cabinet. I haven’t really given it any attention in way too long. There was bottle after bottle of expired medicines. Embarrassing! 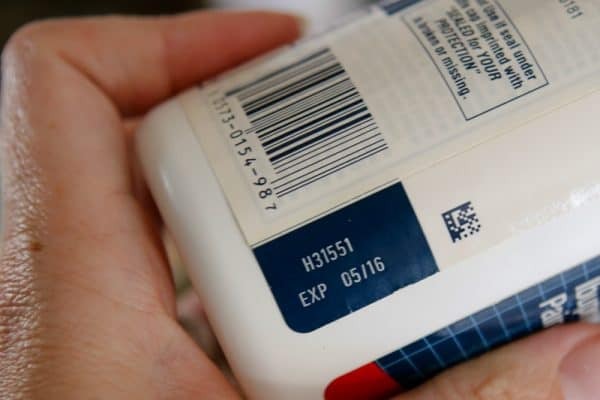 I made sure to go through each and every one of the medicines and check the expiration dates to see if they were still good or not. There wasn’t much left, but I kept the essentials that were still good. Some acetaminophen, aspirin, and that special allergy medicine, Diphenhydramine. 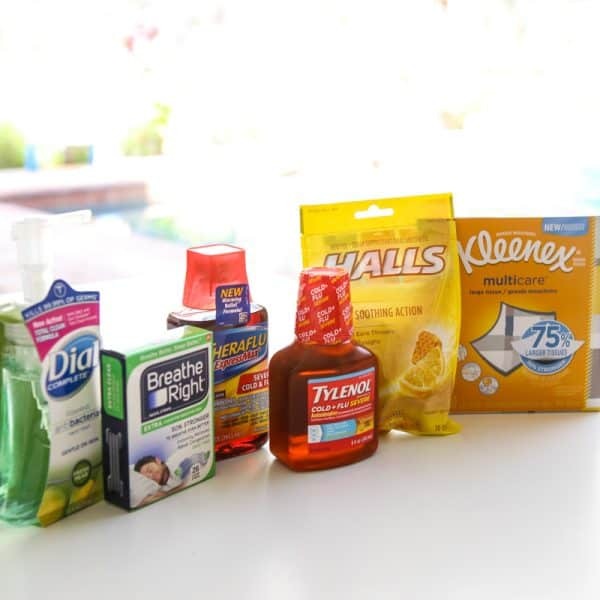 Then I added all the essentials for germ season I had just got from Kroger. I got a great price on all these essentials at Kroger. I got some Breathe Right® Extra Clear nasal strips. I love having these on hand. They make sleeping so much easier when you’re feeling under the weather. They provide relief for congestion due to colds, allergies, or a deviated septum and reduce snoring caused by nighttime nasal congestion. They are also drug free and safe to use with any other sleep or cold medication. These clear strips are easier to remove than the tan ones and are great for people like myself with sensitive skin. I also got some TYLENOL® Cold + Flu Severe Warming Honey Lemon Liquid. This is so great when you’re not feeling your best. It’s a comforting warming liquid to tackle your tough cold and flu symptoms by clearing congestion, relieving coughs and relieving head and body aches. Theraflu ExpressMax Severe Cold & Flu Syrup is one of my favorites. This is perfect when you’re feeling under the weather, but still have a huge list things to do. It’s powerful relief without a prescription. My husband’s and son’s favorite is the Halls Honey-Lemon Bag. I’m never without these. They are so perfect for soothing soothing scratchy throats and relieving coughs. Kleenex Multi-Care is also an essential tissue to have on hand. The tissue sheets are 75% larger and 50% stronger! With these, One tissue is all you need. Finally a large tissue, I love these! And lastly, you have to have some germ killing hand soap. Dial Complete Pear Foam is a great soap that smells beautiful and kills all those pesky hand germs! It’s also America’s #1 Soap* (*based on unit sales of soap products in last 52 weeks scanned data) and it kills 99.99% germs. It also leaves your skin feeling hydrated & soft. You can find more inspiring content by visit the social hub here. There are savings to take advantage of during the month of November on these great products at Kroger! Breathe Right® – Read and follow label directions. Halls – HALLS Cough Drops temporarily soothe sore throats. Kleenex – ® Registered Trademark of Kimberly-Clark Worldwide, Inc. © KCWW. Theraflu – Read and follow label directions. Theraflu is for use in adults 12 years and older. Use products only as directed. TYLENOL® – © Johnson & Johnson Consumer Inc. 2016. Use products only as directed. The makers of TYLENOL® remind you to use only one medicine with acetaminophen at a time. Great tips! Best to be prepared going into cold season!